Leader of Germany’s Social Democratic Party (SPD) has slammed the new US envoy to Berlin for quietly engaging in talks with major German carmakers over a trade dispute between Washington and the European Union. US Ambassador to Berlin Richard Grenell has reportedly been in talks with the heads of German carmakers such as BMW, Daimler and Volkswagen. He argues he is empowered by the US administration to work out a solution to the trade dispute. Grenell, a staunch supporter of President Donald Trump, suggested a “zero tariff” solution, which requires both Berlin and Washington to lift all tariffs on automobile imports from their respective countries. “That is news to me that ambassadors hold talks on such issues. What kind of an approach is it?” she said. “If the US government wants to talk about tariffs with us, then this issue must be discussed between the US Secretary of Commerce and German Minister for Economic Affairs and Energy Peter Altmaier. 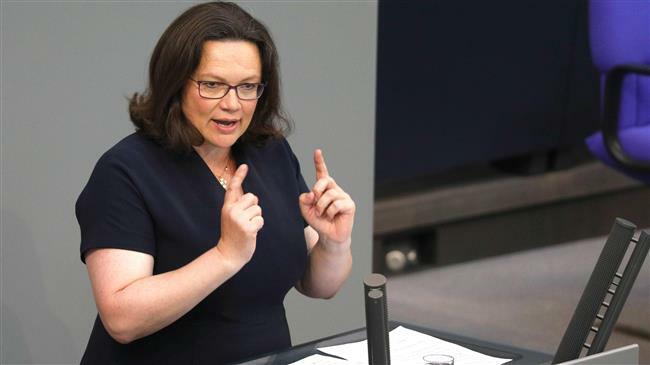 We are not some kind of banana republic!” Nahles added. Washington currently imposes a 2.5 percent tariff on imported passenger cars from the EU and a 25 percent tariff on imported pickup trucks. “If these Tariffs and Barriers are not soon broken down and removed, we will be placing a 20% Tariff on all of their cars coming into the US Build them here!” Trump said last month. The EU also imposes a 10-percent tariff on imported US cars. The move was part of a broader policy taken by the Trump administration to convince European companies to voluntarily disengage with Iran after Washington pulled out from a 2015 landmark nuclear agreement.